The yellow years are ones in which the USA was getting into or out of major wars — or both, in the case of the brief Spanish-American War. The red years are war years, and the blue years are years of (relative) peace. The sectors are each bounded by two radii, and a 1.5° arc. The current year is omitted intentionally because 2016 isn’t over yet, and we don’t know what will happen during the rest of it. The two figures in the chart above are familiar figures for many — but how does “land” break down into continents, and how does “water” break down into oceans, as fractions of Earth’s total surface area? That’s what this second chart shows. With continents, I placed them on the chart to make it easier to see physically-connected continents as sets of adjacent wedges of similar color, separated only by thin lines. The most obvious example of this is Europe and Asia, which are considered separate continents in the first place only for historical reasons, not geographical ones. Combine them, into Eurasia, and it has 36.3% of Earth’s total land area, which is (36.3%)(0.292) = 10.6% of Eath’s total surface area. Even then, Earth’s three largest oceans (the Atlantic, Indian, and Pacific Oceans) are each larger than Eurasia. There are other naturally-connected continents, albeit with much smaller land connections — narrow enough for humans to have altered this fact, only a “blip” ago on geographical time-scales, by building the Suez and Panama Canals. In the case of the Suez, its construction severed, artificially, the naturally-occurring land connection between Eurasia and Africa, and the term “Afro-Eurasia” has been used for the combination of all three traditionally-defined continents. Afro-Eurasia has 56.7% of Earth’s land, but that’s only (56.7%)(0.292) = 16.6% of Earth’s total surface area. That’s larger than the Indian Ocean, at (19.5%)(0.708) = 13.8% of Earth surface area. 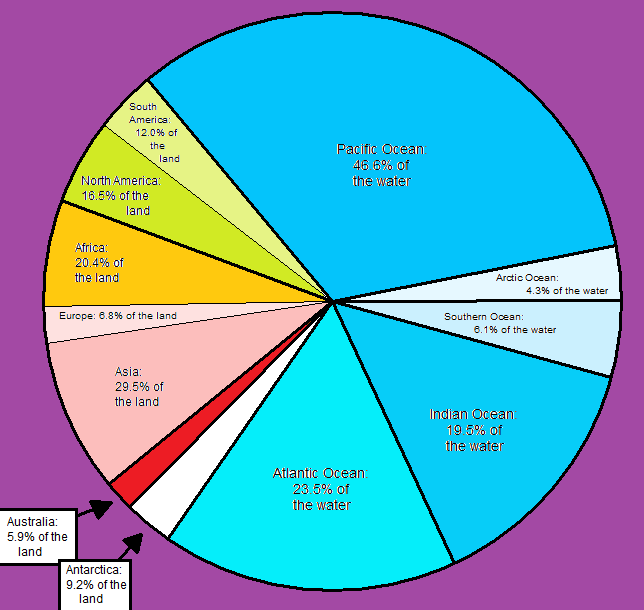 However, both the Atlantic Ocean, at (23.5%)(0.708) = 16.6% of Earth’s surface area, and the Pacific Ocean, at (46.6%)(0.708) = 33.0% of Earth’s surface area, are still larger than Afro-Eurasia. The Pacific Ocean alone, in fact, has a greater surface area than all of Earth’s land — combined. The other case that can be made for continent-unification involves North and South America, since their natural land connection was severed, only about a century ago, by the construction of the Panama Canal. 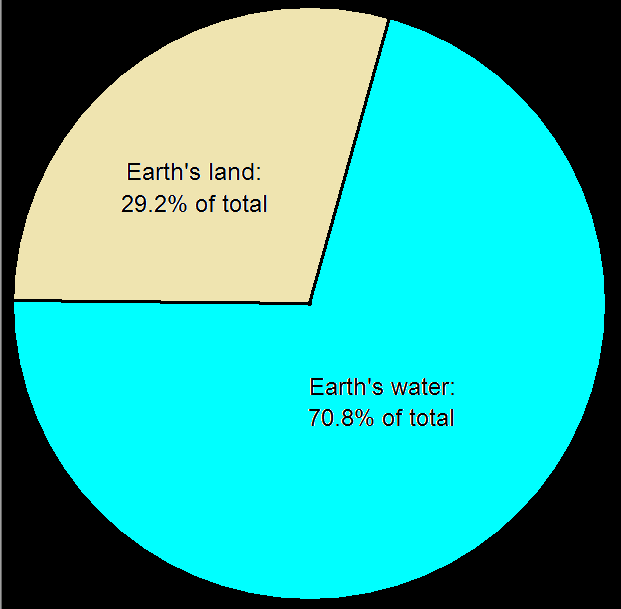 Combine the two, and simply call the combination “the Americas,” and that’s 28.5% of earth’s land, which is (28.5%)(0.292) = 8.3% of Earth’s surface area. (I didn’t simply call this combination “America” to avoid confusion with the USA.) The Americas, even in combination, are not only smaller than each of Earth’s three largest oceans (the Atlantic, Indian, and Pacific), but also smaller than Afro-Eurasia, or Eurasia — or even Asia alone, by a narrow margin. By the way, there are lots of things that don’t show up on the second chart above: islands, inland seas, lakes, rivers, etc., and there’s a good reason for that: on the scale of even the larger pie chart above, all these things are so small, compared to the oceans and continents, that they simply aren’t large enough to be visible.